Works in any vise that holds 2/0 hooks. Tool body precision built of stainless steel with brass fittings. Includes two premium, machined, tapered, and hardened mandrels(.062" and .041") to fit all HMH tubes. An elegant and effective solution for holding tubes. Made of steel in the USA. Clamp the tool in any vise that accepts a 2/0 hook, and you can tie tube flies with ease. Illustrated Instructions included. Still a great package at a great price. 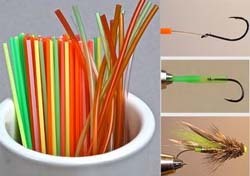 easy to use, universal system of interchangeable Tubes, Tools and Techniques that lets you tie any style of floating or sinking tube fly for any freshwater or saltwater gamefish. The DVD in this package gets you tying tube flies right away. Our Poly tubes are specifically designed to be tough and durable especially in cold water condition. 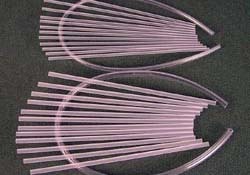 Poly tubes are semi-flexible and won't get brittle in cold water. They are strong enough to stand up to large bulky patterns and have proven to be an excellent tube for winter steelhead. Our Small Poly Tubes (3/32" OD) are good for large and small patterns. 10, 5" single color pieces. HMH Large Poly Tubes (1/8" OD) are especially versatile in that the larger ID will accept many hook eyes, so you won't need to use hookholder on many of your patterns. 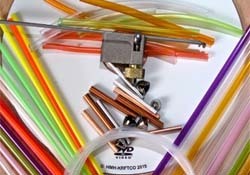 Our HMH Micro Tubing will nest perfectly with these tubes to create flies with standard drilled cone and bead heads or flies with smaller heads and tapered bodies. 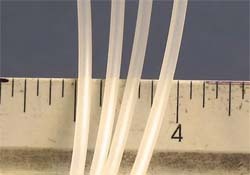 Our Micro Tubing is durable and versatile. Regular (1/16" OD X .042 ID), 36"piece. 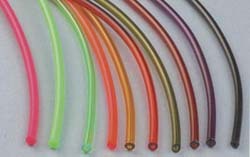 Custom flexible tubing rugged enough to tie on directly, flexible enough to use with any other tube. 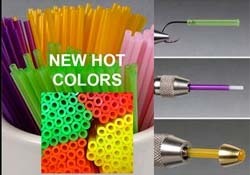 Dual purpose flexible tubing: use as tubes or hook holder. Large 5/32" OD fits over 1/8" dia. and Micro tubes. 1/8" Junction Tubing nests perfectly with HMH Micro Tubing. Available in Bright or Dark Assortments. 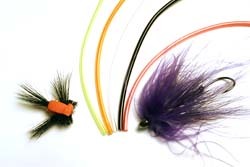 Create tube flies of any length up to 5". You cut to desired length, then finish ends as you like. 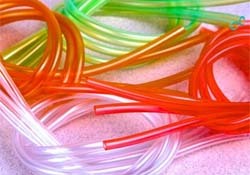 Most versatile and economical tube pack.